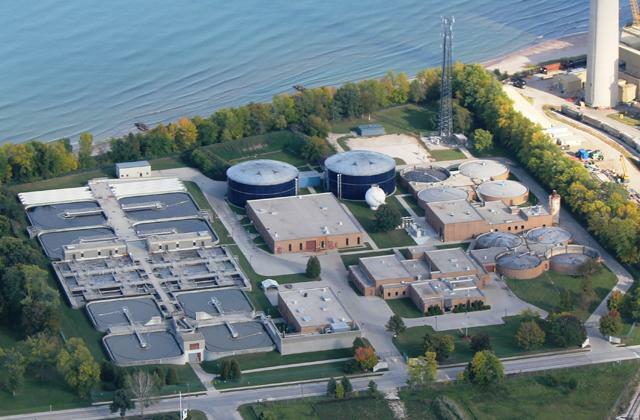 The Sheboygan Regional Wastewater Treatment Facility borders Lake Michigan and is capable of treating 10 million gallons of wastewater per day. The Sheboygan Regional Wastewater Treatment Facility in Sheboygan, Wisconsin, cleans the wastewater for more than 68,000 residents in seven local communities. The plant can treat an average of 10 million gallons each day, with a peak design capacity of 58.6 million gallons per day. It is operated and maintained by 15 skilled professionals who work to produce clean water, which is then returned to Lake Michigan. the new lubrication and dispensing system. At the facility, wastewater passes through a series of five major treatment processes to remove excess nutrients and bacteria. Solids are treated by an anaerobic digestion that produces biogas. The biogas is converted into enough heat and electricity to be nearly 100 percent self-sufficient. The digested biosolids are then dried and can be applied on land as fertilizer. For its biosolids dryer project, the facility chose a color-coded oil system with a 60-gallon capacity in each of the eight containers. 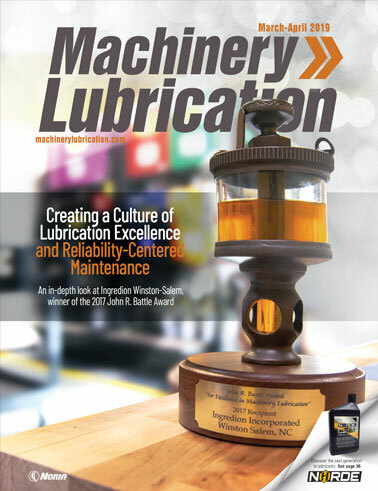 The system includes 1½-inch valve arrangements for heavy viscosity oils, color-coded labels, quick filter assemblies and grounding, as well as a spill-containment pan and sight gauges for inventory control. 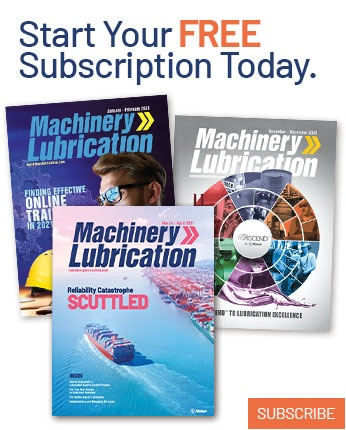 It is designed to reduce the inefficient transfer of lubricants, which can lead to safety issues, more cleanup, increased labor costs and purchasing absorbents. "Before construction of our biosolids dryer project, the size of the oil storage room was 15 feet wide by 50 feet long – a total of 750 square feet," recalled maintenance supervisor Robert Butcher. was a lot of disorganization and clutter. After construction, the oil storage room was only 15 feet wide by 21 feet long — 315 square feet. This represented a loss of 58 percent of the storage space. "It was so bad that we temporarily had to move oil into the solids building," Butcher noted. The facility had to find a way to make up the difference. 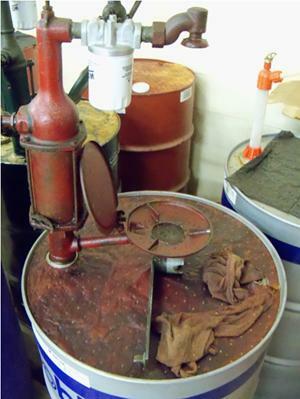 This left the plant with a limited number of options, such as leaving the oil drums in the solids building where space was needed for polymer; returning all used barrels and oil back into the new area, which would be dirty and messy; or purchasing a new and up-to-date oil containment and dispensing system that would be clean, modern and safe. 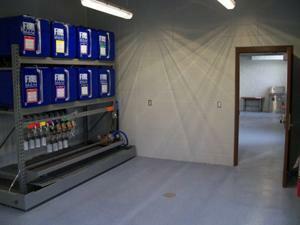 The oil room is now neat, clean and organized. "Every way we looked at it, the systems approach was the best option," said Butcher. "It won hands down in terms of orderliness and efficient use of space." The new lube storage and dispensing system proved to be the answer. 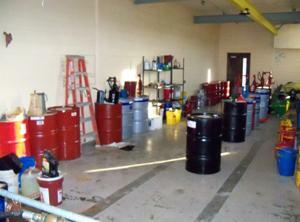 Valuable space was saved, and oil storage at the facility is no longer messy but neat, clean and organized. Larry King is the regional sales manager for the IFH Group in Rock Falls, Illinois. He has 30 years of experience in custom storage and the design of fluid storage.